WASHINGTON — A U.S. Senate panel has proposed giving NASA's James Webb Space Telescope (JWST) about $150 million more for 2012 than the White House requested for the overbudget project, which appropriators in the House of Representatives voted this summer to cancel. 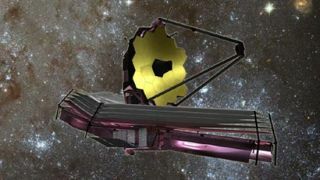 The additional funding for JWST amounts to a 40 percent increase for the project and is part of a 2012 spending bill approved Sept. 14 by the Senate Appropriations commerce, justice, science subcommittee. Overall, the subcommittee's bill would provide NASA with a total of $17.9 billion for 2012. That is about $500 million less than the agency got for 2011 and $800 million less than what U.S. President Barack Obama sought for NASA in the 2012 budget request he sent Congress in February. The Senate subcommittee, by a margin of 15 to 1, voted to send its spending bill to the full committee after a markup that lasted only about 20 minutes. The Senate Appropriations Committee is expected to take up the bill Sept. 15. JWST has a powerful ally in the subcommittee's chairwoman, Sen. Barbara Mikulski (D-Md.). The program is managed by the Goddard Space Flight Center in Greenbelt, Md. Assuming the telescope launches, it would be operated by the Space Telescope Science Institute, the Baltimore lab that manages Hubble Space Telescope science operations. With appropriators in both the House and Senate agreeing to cut NASA's budget, the odds have increased that spending on the U.S. civil space program will decline in 2012. However, the competing bills, which differ dramatically at least in their treatment of Webb, must be reconciled before any NASA budget reaches Obama's desk. With the U.S. government's 2011 budget year coming to an end Sept. 30, time is running out for Congress to complete work on 2012 spending bills. If lawmakers miss the Sept. 30 deadline — as they have done frequently in recent years — NASA and the rest of the government may by funded by continuing resolutions, temporary spending measures that tend to freeze federal spending at or below current levels. That review, conducted in 2010 and led by John Casani of NASA's Jet Propulsion Laboratory in Pasadena, Calif., said the JWST program would need cash infusions of $250 million in both 2011 and 2012 to be ready to launch by late 2015 — more than a year later than NASA's official launch date at the time. Since the Casani report, NASA Administrator Charles Bolden has said that JWST would not launch until 2018, at the earliest. Mikulski, in a statement accompanying her panel's bill, said that the funds provided for Webb would enable a 2018 launch. NASA now estimates that JWST will cost about $8.7 billion to build, launch and operate. That figure is $2.2 billion higher than the already budget-busting lifecycle cost estimate the Casani panel provided last year. At that time, NASA expected JWST to cost about $5 billion, including operations, and launch in mid-2014. Meanwhile, the Senate Appropriations commerce, justice, science subcommittee did not say what projects would get cut to pay for the JWST increase or how much it planned to provide for other high-profile NASA programs, like the heavy-lift Space Launch System and the Commercial Crew program. A Senate aide said that the Space Launch System would get about $1.8 billion. This aide added that NASA's Commercial Crew program would get approximately what it was authorized to receive in the NASA Authorization Act of 2010: $500 million. That's still $350 million short of what the Obama administration requested for the program next year. Also included in the Senate Appropriations subcommittee's bill was $5 billion for National Oceanic and Atmospheric Administration (NOAA), which is $434 million above the 2011 level. The bill includes $920 million for the Joint Polar Satellite System, or roughly $400 million more than the next-generation civilian weather satellite project got for 2011. The subcommittee said other NOAA programs will "face administrative and overhead reductions" to make up for the additional money given to the satellite project.